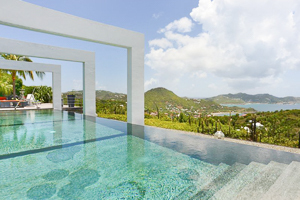 Villa UJV 110, also known as Agave, an amazing villa is located on the hillside of Camaruche, St Barts, has two bedrooms, two bathrooms and a pool. Private and quiet, this modern villa offers gorgeous sunsets and a spectacular sea view over Lorient bay, St Maarten, Fourchue and Bonhomme islands. Next door to UJV 110 is villa AGV, the two villas can be rented together for three bedroom use (there is a gate in the garden to access the villas when rented together; the gate remains closed when the villas are rented separately to provide complete privacy to both villas). Villa UJV 110 is made up of one main building and two independent cottages. The main building features a kitchen, living areas and the master bedroom. The living room, dining room and spacious modern, well-equipped kitchen are all connected. These rooms open onto the large terrace and face the ocean view. The master bedroom of villa UJV 110 connects to the living area. The second bedroom is located in an independent cottage and is similar to the master bedroom. Both have comfortable furniture and modern amenities, open onto terrace, and offer a nice ocean view. The large deck terrace with infinity swimming pool invites you to enjoy the life in the islands and amazing sunsets. Villa UJV 110 is a perfect villa for friends who look for privacy, tranquility and all-day sun exposure. *During the Holiday season this villa includes a third bedroom (UJV 110 AGV), which is located in a fully-equipped stand-alone bungalow.